137 Saturday December 3- 1932. William took me up to see Dr Ned Smith in the AM. He advises being more quiet on account of my heart. Hattie down in afternoon Cora came for her Cold and rainy. Ott here before supper he brought me $54.78 interest on bonds. I felt better by evening. Sunday December 4- 1932. I was not out of the house all day. Mrs Gay brought my dinner up to me. Rob & Cora as well as William and Mary called in PM. Wrote Blanche Black in evening Monday December 5- 1932. I was busy most of the forenoon Letter from Laura Ott brought me $24.80 interest. 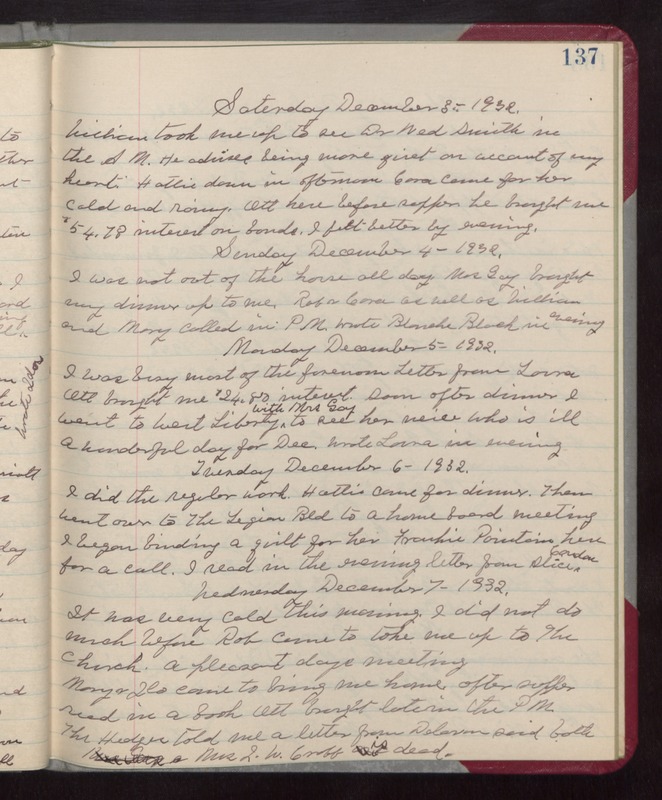 Soon after dinner I went to West Liberty with Mrs Gay to see her neice who is ill A wonderful day for Dec. Wrote Laura in evening Tuesday December 6- 1932. I did the regular work. Hattie came for dinner. Then went over to The Legion Bld to a home board meeting I began binding a quilt for her Frankie [Pointain?] here for a call. I read in the evening letter from Alice Condon Wednesday December 7- 1932. It was very cold this morning. I did not do much before Rob came to take me up to The Church. a pleasant days meeting Mary & [Ilo] came to bring me home. after supper read in a book Ott brought late in the PM. The Hedges told me a letter from Delavan said both Mrs J.W. Croff is dead.